Not only are they annoying, mosquitoes can spread disease like West Nile, zika, and dengue fever. Controlling mosquitoes around your home is possible with DoMyOwn’s selection of repellents, insecticides, foggers, dunks, and mosquito control kits. Treat your backyard and property for mosquitoes like the professionals do. 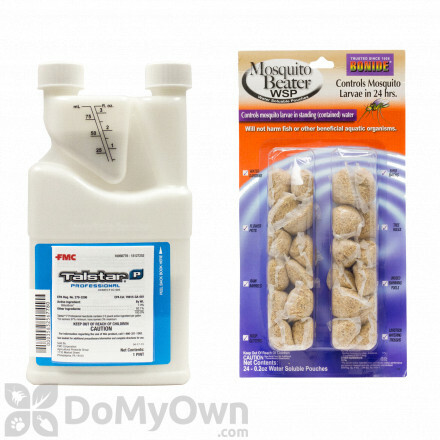 Save money and time and rid your home of mosquitoes with professional products. 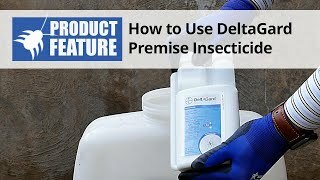 A professional wettable powder insecticide for crack and crevice and spot applications for residual and contact control of many common insects. A professional insecticide that controls many insects indoors and outdoors in commercial and residential areas. A professional insecticide that kills and controls mosquitoes and other insects in commercial and residential and for indoor and outdoor applications. A professional micro-encapsulated water-base insecticide for commercial & residential indoor & outdoor areas. A professional water-based ULV fogging insecticide with 5% pyrethrins for commercial and outdoor applications. A professional IGR (Insect Growth Regulator) insecticide for commercial & residential indoor & outdoor applications. A non-residual contact insecticide with a slight odor. It is labeled for just about every pest you could have a problem with, including bed bugs. A professional insecticide that controls over 30 insects for commercial & residential indoor & outdoor applications including lawns & landscaping. Slowly releases a vapor that kills insects in an enclosed space for up to four months. A professional insecticide that is an IGR (Insect Growth Regulator) for commercial & residential and Indoor & outdoor applications. A professional aerosol insecticide fogger that kills fleas, ticks, mosquitoes, roaches, and others for commercial and residential applications of 5,000 cubic ft. per can. A professional insecticide with Permethrin for ULV fogging or mosquito misting systems in commercial and residential indoor and outdoor applications. A professional insecticide that controls insects for commercial & residential indoor & outdoor areas including turf-grass and ornamental landscaping. A professional insecticide that controls many common insects for commercial & residential indoor & outdoor applications including lawns. Do you have mosquitoes flying around? Mosquitoes can take all of the fun out of outdoor activities. They bite over and over again, leaving everyone annoyed and itchy. 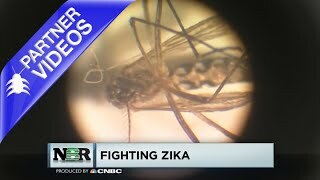 In recent years, mosquitoes in the US have even been proven to spread dangerous diseases. You can help control mosquitoes on your property by following these steps. Step 1: Take a good look around your yard for anything that can hold rain water. Bird baths, Flowerpots, Ornamental fountains, Gutters, Water gardens, Rain barrels, Pool covers, puddles, animal drinking containers, shallow ponds or yard debris can become home to mosquito larvae. Empty or remove these items if possible. 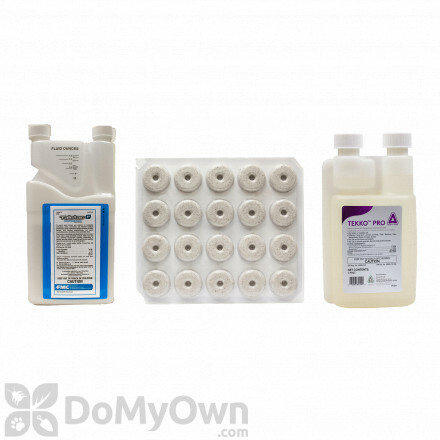 If emptying or removing the items is not possible you can use a larvicide such as Mosquito dunks or Altosid. This will stop the larvae from being able to develop into adult mosquitoes. 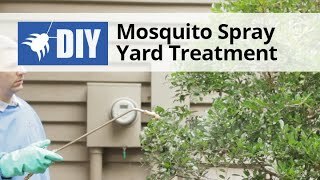 Step 2: We are going to show you how to effectively apply mosquito insecticide in your yard. Select a product that is specifically labeled for mosquito control in residential yards such as Talstar P or Demand CS. Now you need to choose the equipment that will best fit your needs. For small yards you can use a pump sprayer for the application. For larger yards we recommend using a larger capacity mist blower. 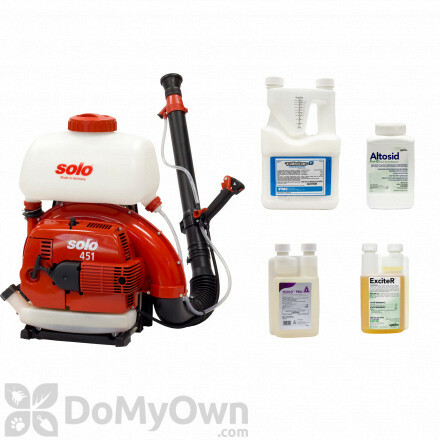 All this equipment and these products are available on DoMyOwnPestControl.com. Step 3 Mix the mosquito insecticide as indicated on the product label. 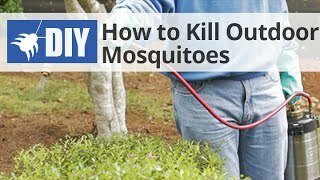 The key to a successful mosquito treatment is to apply the solution to all shrubs, trees, and other foliage around the house or where you are trying to provide relief. You should direct the application not only on top of the leaves, but on the underside of the leaves as well, which is where mosquitoes hang out during the heat of the day. Applications to the overhangs of houses or other structures will also help to get rid of mosquitoes on your property. Step 4: Reapply the mosquito insecticide every 30 days throughout the mosquito season. With the right products and by following the mosquito treatment steps we have outlined for you, you can make your yard become a mosquito free haven. For more information on getting rid of pests and for the products needed, visit DoMyOwnPestControl.com. Mosquitoes’ preferred breeding sites are stagnant or standing water, such as the water that is left in basins and bins after a rain shower. 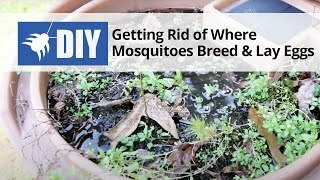 One easy step towards controlling mosquitoes is making sure that there is never standing or brackish water around your property. You could say that eliminating these water sources is one natural mosquito repellent you can employ. Because mosquitoes are airborne insects it is recommended to utilize a fog, or other aerosolized product, when you are combatting these bugs. 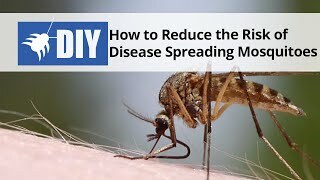 Although topical applications can be useful as a mosquito repellent they are nearly useless when it comes to knocking out the adult mosquitoes that can spread illness. The best mosquito killer you can buy is Talstar insecticide. You can apply this mosquito killer to any kind of plant or shrubbery in your yard (that does not produce anything edible) and it will provide protection for up to 30 days. Make sure to spray the underside of the leaves since this is where mosquitoes lay their eggs. While these plants have been said to help repel Mosquitoes, we recommend that you use professional Mosquito control products to effectively control Mosquitoes.